The club is based at Ponds Forge International Pool, Sheffield City Centre. The club meets every week in term time (ie. except during school holidays) on a Wednesday evening at 19:15. First Aid (Dry-side) training starts at 19:20 prompt. Pool (Wet-side) Training starts at 20:00. 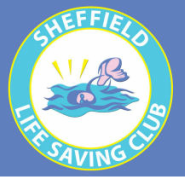 The club adheres to the RLSS Syllabus for Rookies, Bronze, Silver and Gold modules. We also undertake our own interim awards to swimmers for their endeavours throughout the year. Please always check the Calendar for appropriate dates and timings of events(etc..). The website is intended as a resource for the activities, events, news, calendar/diary, letters, club meetings, tweets and general info about what is happening at the club. Please go to CLUB NEWS for the latest news, events, and communiques. If you'd like to know more information about the club and its activities then please contact us for further details. Thanks.